This may be confusing for those who don't live in the region, so I'll inject a note right here... Little Diomede ISLAND is known locally as Ignaluk (IG-nuh-luhk). Diomede the VILLAGE is actually named Inalik. A reminder of this type will also appear on the page for Diomede Island. Diomede is located on the west coast of Little Diomede Island in the Bering Strait, 135 miles northwest of Nome. It is only 2.5 miles from Big Diomede Island in Russia, and the international date line lies between the two islands. Diomede is in the Cape Nome Recording District. The area encompasses 2.8 sq. miles of land and 0.0 sq. miles of water supporting a population of 146. Diomede (Inalik) is the only settlement on Little Diomede and within it are evident all the contradictions and complications of Eskimo life. The weather is fierce and pitiless. During summer months, cloudy skies and fog prevail. Winds blow consistently from the north with gusts to 60 or 80 mph. The Bering Strait is generally frozen from mid-December to mid-June. The weather can be extremely cold and windy for many months of the year. Blizzards are common. Though the mercury can top 60° in the summer, temperatures of -40° are not uncommon in the winter. It usually is late spring before the snow and ice melt. The only regular transportation to the island is the weekly helicopter flight that brings the mail. But fog, wind and storms can cause travel delays of days, weeks and even up to a month. The village itself is on a small patch of the island by the ocean, the only area that is not almost-vertical cliffs. 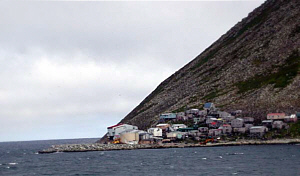 Little Diomede Island has about 160 residents, all of whom live on the southwest corner. There is a small rocky beach immediately West of the village and from there the land rises steeply on all sides to 1,250 feet. The top is broken tableland with no trees or shrubs and scant vegetation. The remainder of the island is cliffs. Due to the rocky terrain, the only way to get around town is by foot and this can involve some steep, difficult climbing. There are some snow machines that can be used when the Bering Strait freezes. The only way to get to Diomede from spring to winter is by helicopter. The helicopter generally makes one weekly trip, weather permitting. Once the Bering Strait freezes and a runway can be plowed, several flights may arrive during the week; again, weather permitting. Aleut village of Inalik. Notice how all the buildings are clustered at the base of the mountain. No margin is left for a village along the shore, so, like the seabirds that breed here and fly about in countless multitudes darkening the water, the rocks and the air, the Natives had to perch their huts on the cliffs, dragging boats and everything up and down steep trails, The huts are mostly of stone with skin roofs. They look like mere stone heaps, black dots on the snow at a distance, with whalebone posts set up and framed at the top to lay their canoes beyond the dogs that would otherwise eat them. The dreariest towns I ever beheld - the tops of the islands in gloomy storm clouds, snow to the water's edge, and blocks of rugged ice for a fringe; then the black water dashing against the ice; the gray sleety sky, the screaming water birds, the howling wind, and the blue gathering sludge! The Inupiaq name for the village is Inalik, meaning “the other one” or “the one over there.” The population is largely Inupiat Eskimo who have lived in the area for many generations. The present village site, which is believed by some archaeologists to be 3,000 years old or older, was originally a spring hunting site and gradually became inhabited as a permanent settlement. Western explorers found the Diomede Eskimos had an advanced culture, practicing elaborate whale hunting ceremonies. Headline: Little Diomede Island, August 1994: The village residents are accumulating cash and grocery supplies and local dancers are practicing almost every night. The islanders are preparing for a visit of more than one hundred friends and relatives from "Siberia," and they are eager to be hospitable and generous hosts. Headline: Little Diomede Island, January - July 1944: According to records kept by the local schoolteachers 178 people from Big Diomede and the Siberian mainland had been visiting the island within these six months. These two headlines might create the impression that little has changed over the last fifty years of intercontinental contacts. However, we all know that official contacts were forcefully disrupted in 1948 and it was not until after 1988 that they were permitted again. Historically, Diomede residents hunted on both sea and ice and traded with natives in both Asia and Alaska. They were closely related to families living on Big Diomede Island. 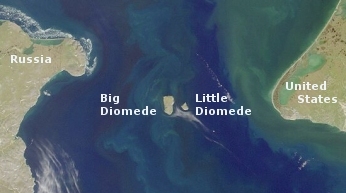 As well, Big Diomede was once home to families living on Little Diomede and the larger island played an important role in its smaller sister's subsistence. During WWII, Big Diomede served as a Russian military base. 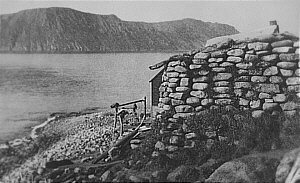 All residents were removed to the mainland, and any Little Diomede inhabitants who strayed across the waters too close to Big Diomede were taken captive by the Russians. The long years of the Cold War turned the Bering Strait (a kind of watery Berlin Wall, then) into a No Man’s Land - a chilling ideological curtain rising between Big Diomede and Little Diomede, as invisible as the International Date Line that passes between the two islands. When the Soviet Union sealed its borders in 1945 and established the Iron Curtain, Big Diomede remained a military base. While some members of a family (Eskimos) immigrated inward into Russia, others moved eastward to American shores. Those living on Russian soil eventually fully integrated into Soviet society. They had to abide by the same travel restrictions as all other Soviet citizens landlocked within the boundaries of the USSR. At that point, the two island communities, connected by Eskimo family kinships but separated by American/Russian politics, led parallel lives - pictures of Karl Marx hung in the Russian schools, pictures of Abraham Lincoln in the American. Little Diomede villagers watched Warner Brothers films, Big Diomede watched movies made by Lenfilm. Although officially forbidden to do so, Eskimos from the two sides did occasionally meet on the International Date Line under the cover of fog, visiting briefly, and exchanging small gifts. In the age of Gorbachev, perestroika, and glasnost, the Cold War thawed, and interest in reuniting with families across the Bering Strait revived. However, many of the residents of Little Diomede never saw their relatives again. My home is located in the Bering Sea, one hundred and eighty miles northwest of Nome. The name of the island is Diomede. The village is located on the west side of the island. The climate of Diomede is much warmer than the mainland in the winter time. The temperature ranges from twenty to thirty-five below zero in the winter. In order to protect ourselves from cold, we use mukluks and parkas. The parkas are made from reindeer and squirrel skins. The mukluks are made from either reindeer legs or seal skins. In the summer we wear lighter clothing. In the first part of July, we have warm days until the last part of August. We have very little rain, but in the winter the snow fall is rather heavy. The approximate number of people on the island is one hundred and sixty. The people at hone make their living by hunting and carving ivory. Fishing is not so common. The fish they catch are bullheads, tomcods, bluecods, etc. There is also some crabbing in the winter time. The people over on big Diomede Island do more trapping than we do for the reason that the island is much larger than our little Diomede and it belongs to the Russian government. The Russians do not allow any American to trap foxes in their territory or get any kind of fur. About eight or ten years ago we used to get most of our furs from Siberia, such as reindeer, wolverine, wolf, and white fox. In April we start to hunt for whales, seals and walrus. Recreations at home are skating, snowshoeing, hand ball, foot ball and Eskimo dancing. Since there are no movies, the people spend the rest of the evenings by telling jokes and old-time stories. There is no traveling in winter time at Diomede, except going to big Diomede. The distance is about five miles, and in the winter the ice doesn't freeze up between the island usually. In the summer we travel in skin boats equipped with outboard motors. They either go to Siberia or Wales. In July half of the population goes to Nome to spend the summer for trading. Most of our carving and skin sewing is sold at Nome. They we return home on the MS North Star in October. The village is run or governed by the village council. These councilmen serve three year terms. A long time ago the village was run by a chief whose name was Kosinga. The old Russian name of the two is lands was "Krusenstern." That was when the village was run by a chief. I don't know why the name was changed to "Diomedes." There is no wireless communication on the island, except the radio receiving sets. No airplane comes to Diomede except for some very special reason, during the winter. The MS North Star brings groceries for the people on the island from Nome. At the same time she unloads freight for the school teachers. The Coast Guard cutter Northland comes in twice during the summer to look after the natives. In order to improve the village there should be a doctor and a nurse, and a hospital for the village. They should have a wireless station and more radios, so the people on the island could have better contacts with other places and from Outside. In order to have more recreation there should be a gymnasium and a moving-picture show. There are lots of other things needed on the island in order to improve the village. Note: Arthur married Kate Brower, of Barrow, [who taught] arts and crafts at Point Lay for the Office of Indian Affairs; two children. Fr.1 Bellarmine Lafortune, S.J.,2 was the first Catholic missionary to arrive at Diomede, in June of 1913, though his stay was brief. Fr. Hubert Post, S.J., arrived three years later, in 1916. By this time a fair number of Little Diomeders were already Catholic, having been brought into the Church by Lafortune during their annual summer stays in Nome. It was Fr. Lafortune who, in 1935, laid the plans for the first church building on the island. Up to that time the parish had used a small building as place of worship and living quarters. Fr. Thomas Cunningham, S.J., was sent to Little Diomede in 1936. He was the first priest to take up residence there. He spent a total of eight years living on the Island, from 1936 to 1947. He built the new church building with donated lumber from Nome and dedicated it to Saint Jude. After 1947, Fr. Cunningham visited the Island, weather permitting. Fr. Harold Grief, S.J., served the parish intermittently and Fr. Gerald Ornowski, M.I.C.,3 spent the summer of 1977 there. While tenured on Little Diomede, Fr. Thomas Carlin built a new church and living quarters with the help of Brother Ignatius Jakes, S.J. It was blessed by Bishop Robert Whelan, S.J., on March 3, 1979. Fr. Carlin remained as resident priest from 1979 until 1983. The Little Sisters of Jesus were also residents at Little Diomede beginning in 1954 up until 1996. Saint Jude parish has been regularly visited by priests out of Nome. In 1953 Gerald F. and Donna Carlson were assigned to Little Diomede Island where they were the only teachers for all grades K–12. At that time there were 130 Inupiat on Little Diomede – 35 were students from K-8 in a one-room schoolhouse. The schoolhouse also served as the Carlson’s home – it being the only square building on the island except for a small Catholic church, St. Jude's, built by Father Tom Cunningham. Gerald and Donna needed to adapt their teaching methods to local needs. Their primary challenge was getting in 180 days of classtime before walrus migration began in the spring when everyone was needed to help with the annual hunt. As a result, it was necessary to teach through holidays and some weekends. Fortunately, they experienced no discipline problems because the children were excited to learn. Beginning students had to be taught English since their primary language was Inupiat. Gerald had other duties he had to learn on the job – a prime one being radio operator, the school's ham radio being the only means of communication with the outside world. Another necessity was his learning basic medicine, as the island had no medical care. Donna became pregnant and at the end of the school year the couple elected to return to Washington state in the fall of 1954. Residents are living in houses. There is a grammar school with six elementary teachers as well as a high school with four teachers. Eskimo culture is emphasized in school and in the local council. Electricity had come to the island in the 1970's - bringing television, telephone service, and computers with it. Residents still do not have refrigerator-freezers, food is buried in the permafrost instead. The community has satellite television. The town has a store which offers a limited selection of groceries when compared to large lower-48 super markets. All freight has to be shipped by plane and if the planes are unable to fly due to bad weather, then stocks cannot be replenished. Diomede has a post office and a health clinic to take care of basic medical needs. Major medical concerns can be taken care of in Nome or Anchorage. 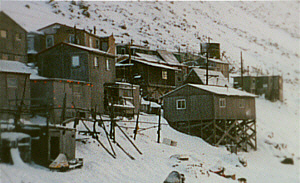 Diomede was incorporated as a second class city in 1970. 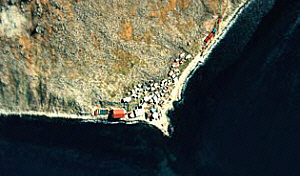 A federally recognized tribe is located in the Native Village of Diomede (Inalik). 93.8% of the population are Alaska Native or part Native. Living is still largely subsistence, and hunting methods ancient and traditional. Puffin-like sea birds called auklets are caught in nets at the end of 12-foot long poles. The Inuits hunt walrus, seals, and beluga whales, though nowadays they shoot rather than harpoon them. When the first ice of winter, the 'slush ice' as they call it, comes down from the north, they lie in wait for the polar bears that come down with it. Mainland Natives come to Diomede specifically for these bear hunts. Almost every part of the animal is used for food, for clothing, mukluks, even boats. Seal and walrus hides are used to make individual clothing items, parkas, hats, mukluks, and furs and skins for trade. The Inuit people of Little Diomede are allowed to pay their taxes to the Internal Revenue Service in ivory collected from walrus hunts. They are the only people in the United States that are allowed to pay taxes with something besides U.S. currency. There are a limited number of small businesses in Little Diomede. The most prominent of these is the Little Diomede Native Store which stocks a variety of food and beverage items, some clothing, fuel, ammunition and some firearms. A few residents work for the local government or school. There has been some commercial fishing and mining on the island, but both industries are in decline. Diomede boasts some extremely impressive ivory carvers who sell their works in Fairbanks and Anchorage. Additionally, the village serves as a wholesale agent for ivory. With an influx of whalers in the latter half of the 1800s, the Inuits became acquainted with seaman's whittlings. They quickly found a market for their own carvings, selling them to the whites. Happy Jack, also known as Angohwazhuk (c. 1870-1918) of Little Diomede Island, is thought to have been the first Inuit/Eskimo to carve cribbage boards. He was influenced by American seamen's scrimshaw after he made several voyages to San Francisco on board a whaling ship. Many of the finely incised designs accurately depicted the animals and daily activities of the Inuit. Other images represented foreign ways of life and were probably copied from magazines, package wrappings, and advertisements. The limited terrain does not allow for a runway, so weekly mail delivery is made by helicopter. Float planes rarely risk landing on the rough seas in summer, but ski planes do occasionally land on an ice runway during the winter months. Most supplies come from an annual barge delivery. The sale and importation of alcohol is banned. Water drawn from a mountain spring is treated and stored in a 434,000 steel tank, and families haul water from this source. The tank is filled for winter use, but the water supply typically runs out around March. The washeteria is then closed and residents are required to melt snow and ice for drinking water. All households use privies and honeybuckets. The washeteria/clinic is served by a septic system and seepage pit. Due to the soil condition, lack of ground cover and steep terrain, there are limited waste disposal methods. Refuse disposal is an individual responsibility; combustibles are burned. October 1972: According to KNOM reports, Diomede Islanders spot an umiaq (oo-mee-ack, a walrus skin boat) from the Russian side floating at the International Date Line. They scramble to gather chewing gum, candy and cigarettes and rush to visit their relatives. August 7, 1987: KNOM receives a telephone call from Alaska’s Little Diomede Island. On the Russian beach, Richardson has transmitted a report via Citizens Band radio, which a Diomeder has tape recorded. It is illegal to gather news via CB (and extremely illegal to use a CB transmitter in the Soviet Union! ), but the tape already exists, and KNOM decides to air it, so as not to upset the people of Diomede. October 29, 2002: Transported via National Guard Blackhawk helicopter, U.S. Senator Ted Stevens arrives on an overnight visit to incredibly isolated Little Diomede. It was the first time that the tiny village in the Bering Strait had hosted a statewide elected official. "I didn't realize you were this remote," Stevens said.